Starting the vector i thought it wouldn't be much of a challenge, but it took longer than expected x_x mostly on Ichigo with the amount of detail on him especially the hair. with the icey smoke/clouds and falling snow with the dark background to link with the storyline of the movie with Rukia fading away from society. Very original image and work, I like the simpleness of it! The black bg suits well and stresses glances and atmosphere! super nice wallpaper and i like the effects. 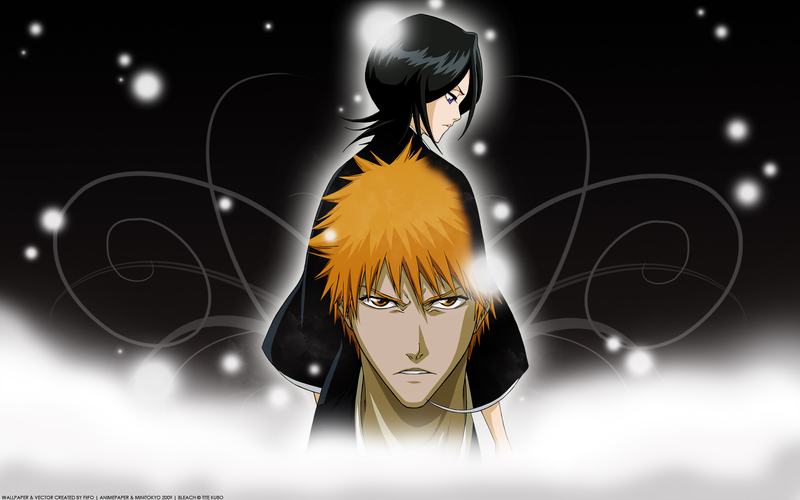 this image is very cool but, if i have your permict, i don't put in the image rukya but only ichigo. however the use of black and white is very cool. Very Nice I might say, I really like this, If you don't mind one thing i would say could be changed is how you faded Ichigo's right side instead of in a striaght line rather if you did like a lilttle jagged fade it would look reallly cool. Other Then that great work. It looks exactly like the original, only much more nicer. Cool. Rukia looks sad. :( Can't wait for this movie. Awesome wallpaper. Rukia is perfect.